This past spring, Troop 353 scouts participated broadly in the multiple advancement opportunities as invited guests to Riverdale Troop 240’s annual Wintoree merit badge seminar. 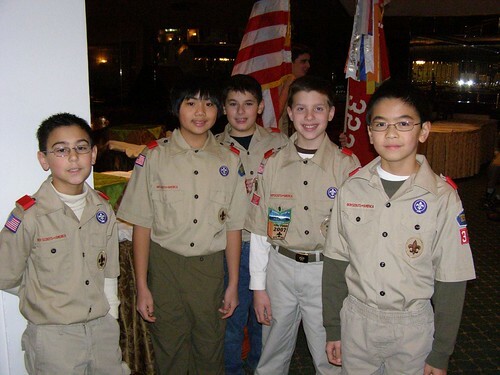 Riverdale Troop 240 is one of the larger troops in the Greater New York Council and, in many respects, is regarded as a model troop, notably through the number of dedicated and committed BSA-trained leaders. The large, well-planned event was held at Camp Durland at the end of March. Troop 353 was fortunate to be invited to such a special advancement opportunity. Years of relationship building between the two troop’s senior adult leaders allowed this rare opportunity to become reality. With ample preparation, T-353 scouts completed over 40 merit badges, with several being Eagle-required. A few T-353 leaders also participated in instructing merit badge classes. In addition, troop 353 received an added benefit of witnessing a rare Wood Badge beading ceremony for two of T-240s adult leaders Mary Ellen Willen and Dino Forzano, following 18 months of “working their ticket” (achieving 5 strategic goals related to the betterment of the troop). Importantly, T-353 scouts and adult leaders were introduced to the notion that all registered adult leaders can and should pusue their own special training and advancement through the Wood Badge leadership program. It’s common knowledge that more trained adults equates to a stronger troop program for Scouts & T-240 was a living example of this old adage. Saturday night also witnessed a fun, but chilly, joint campfire and bountiful Cracker Barrel (sponsored generously by T-240). Finally, another “gift” from T-240 was the receipt of an Interfaith Services Prayer Book, utilized in a 15-minute Sunday morning service (a Scout is Reverent). Troop 353 is extremely grateful for being invited to such a well-managed event and being able to witness such terrific Youth Leaders in action, like T-240’s SPL Kevin B. The enduring benefits to T-353 from participating in the Wintoree far exceed the +40 merit badges that our scouts received. A heartfelt thank you to T-240’s dynamic Scoutmaster Joe Acquafredda and his wife, T-240 Committee Member & Event Coordinator, Edna for being such generous hosts. Great photos from this special and memorable weekend can be found here. Troop 353 extends its deepest sympathies to the family of Frank McCluskey, our dear friend and Assistant Scoutmaster, who died suddenly on April 15 at the age of 49. Frank was an active and much-admired parent leader who enjoyed the camaraderie of Scout overnights – we particularly recall his enjoyment of our trips to Montauk and Clear Lake. He was always one of the first to ask others, “what do you need me to do?” Over the past year, we came to know Frank as a wonderful father, a committed supporter of scouting, and a great guy to have around the campfire. If there ever was a role model in servant leadership, it was Frank. We will miss his sense of humor and friendly voice. Frank’s obituary appears in the Journal News here. Contributions are suggested to: The American Cancer Society, 2 Lyon Place, White Plains, NY 10601. We’d request that parents and friends use the comments section of this post to remember one of our own who left us too early. Green Bar Copes with COPE Course! Several senior members of the troop’s Green Bar Patrol had an exhilirating day when they recently visited Camp Mattatuck’s Project COPE course in Plymouth, CT. The purpose of the trip was to give the youth leaders of the troop a chance to do something more suitable to older boys and as a reward for their extra hard work at running the troop all year long. The day’s fun events turned out to be a terrific exercise in building teamwork and camaraderie. Though most folks have not heard about Camp Mattatuck, it is an easy 90 minute drive from our locale. The Project Cope course is run by Connecticut River Council’s Chris Moon. Chris is an outstanding scouter and is well-known nationally, as he teaches climbing instruction at Philmont Scout Ranch every year. In fact, the cover of the Climbing Merit Badge pamphlet shows the picture of Camp Mattatuck’s unique outdoor climbing wall. Chris’s staff is well-trained and were terrific guides & coaches throughout the day. 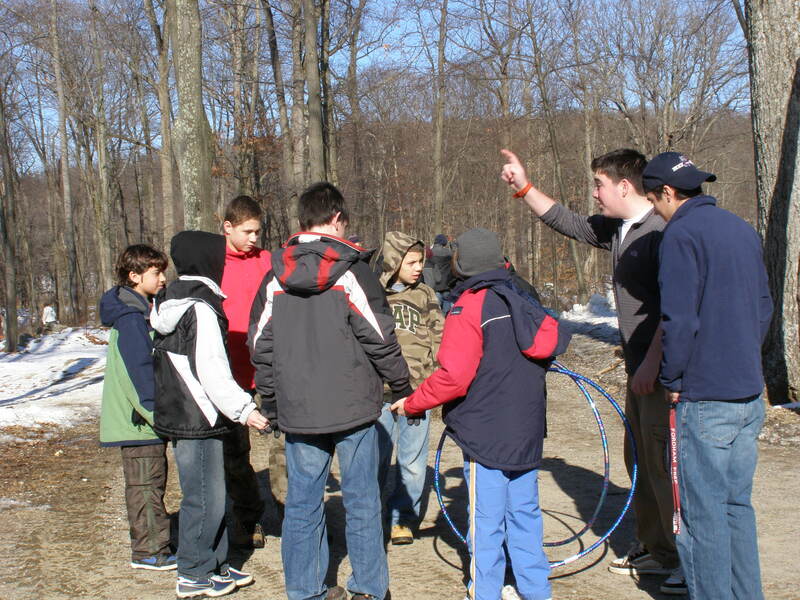 The chilly Mid-March morning was comprised of several “low initiative” challenges–in each setting the boys had to work as a team to solve the challenge. 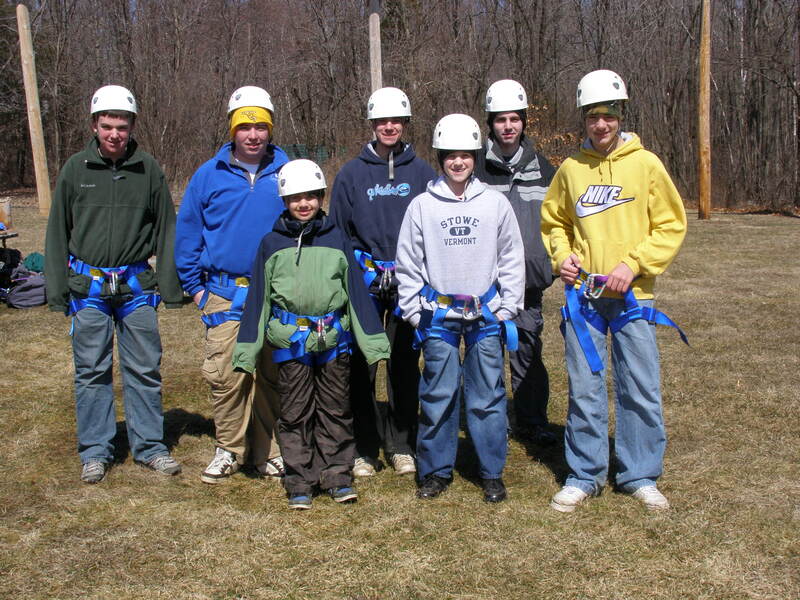 During the afternoon, the scouts and the scoutmaster, tackled the easiest of the three High Ropes courses. The High Ropes challenge was even more pronounced given the near-gale force crosswinds. The last station was an unbelievable +600 foot long zip line that started from a small platform about 50 feet up in the air. Needless to say, everyone had a truly great & fun day and it was decided that the upcoming group of Green Bar leaders would revisit Camp Mattatuck during the summer as a way to build stronger teamwork relationships earlier during their tenure in the troop’s leadership positions. Take a close look at the many fabulous photos of the scouts during the various challenges presented throughout the day by clicking this link. Author scoutmasterPosted on April 15, 2008 July 3, 2008 Categories Activities, Events, PhotosLeave a comment on Green Bar Copes with COPE Course! 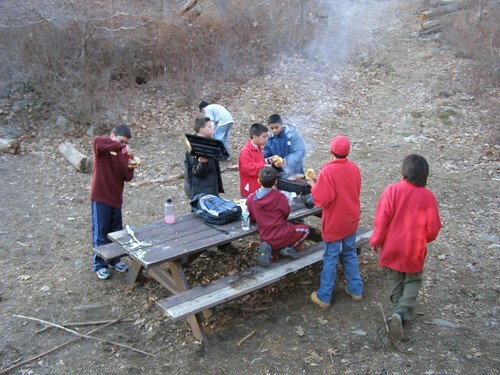 It goes without saying in Scouting that the more BSA-trained a troop is, the better its program. With that thought in mind, the senior members of the Green Bar, along with terrific planning insights from one of Westchester Putnam Council’s ace training gurus Donna Ragusa, worked extensively for 2 months to plan an expanded Troop Led Training (TLT) module. The Green Bar leaders, led by SPL Conor M., decided that the whole troop should participate, so that there could be a better appreciation of what is involved with youth leadership positions. 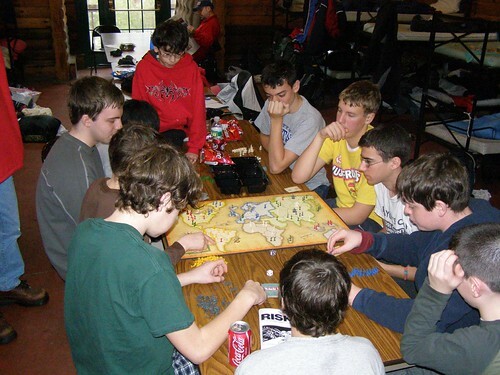 The format was a cabin campout at Camp Durland in mid-February and attendance was mandatory. The Green Bar leaders mixed discussions about youth leadership roles and responsibilities with a series of fun team-building activities. Beginning with a short discussion on Friday night, the troop had completed all 3 traditional sections of the TLT (along with a brief discussion of leadership from the NYLT training module led by the Scoutmaster) by lunch time on Saturday. The afternoon was reserved for a lengthy specialized, game of capture the flag, which reinforced some of the team building principles of the TLT module. In addition, Webelos from Pack 353 & 7 visited us for the afternoon game and stayed for an early dinner, prepared by the troop’s adult patrol of “Old Goats”. All in all, the Green Bar patrol did an outstanding job of running their first TLT module & probably the first one ever for the whole troop! Some great pictures can be found by clicking through this link. Here’s the short story: one cabin, two turkeys, four hours without power, five inches of slushy rain and melting ice, and 30-odd Scouts and adult leaders huddled inside against the torrential Catskill weather. But those numbers don’t tell the whole story of the wash-out that couldn’t stop Troop 353. Sure, the weather report was somewhere between “horrible” and “catastrophic,” and the rain made the lake at Ten Mile River too treacherous for ice-fishing. Yet, the Scouts worked on advancement activities and still managed a (very wet and cold) slushball battle and some icy sledding. Then there was the birthday cake, the hot and delicious turkey dinner, the endless card games, a truly epic game of Risk (above), and the ghost stories around the fire. Oh, and the black-out – dark, cold and firewood dwindling, the troop crept into its sleeping bags in full clothing to ride out the storm. Then the power came back, the morning came, the bacon fried up well, and a wet cabin weekend became yet another great memory of Scouting. For some great pictures, click here. On Monday January 21st, Boy Scout troop 353 once again participated in the Annual Reverend Dr. Martin Luther King, Jr. breakfast, sponsored by the Eastchester Community Action Program (ECAP). The hugely popular tri-community event had several hundred attendees, including many political dignitaries from the surrounding Eastchester, Tuckahoe and Bronxville communities. This year, the event honored the memory of Mrs. Vivian T. Yancy, the ECAP Area Director for nearly two decades, whom passed away last fall. Troop 353 has had the honor of working with Mrs. Yancy over the past +12 years in its annual Thanksgiving Food Drive. Unquestionably, Mrs. Yancy led a quiet life of joyfully and faithfully serving the greater Eastchester community—much like the Reverend Dr. Martin Luther King, Jr. and very much like the principles of Scouting. The celebration this year astutely highlighted key events in Dr. King’s life performed by school children from all three area school districts of Eastchester, Tuckahoe & Bronxville—something that has never been done before. Troop 353 was proud to perform the opening flag ceremony and to lead the huge crowd in the pledge of allegiance. For more pictures of this wonderful 2-hour service project, click here!